Find out how to lay a carpet yourself read our how-to guide which includes practical tips and a video tutorial you can follow step by step. Carpets, often overused and underappreciated. Traditionally they were used as a means to provide warmth and comfort in homes at a time where underfloor heating was none existent. They are able to turn a house into a home, and living space into a warm and inviting environment. Modernly, they have the same effects only with the added bonus of advanced technology, this has given rise to the ability to provide different and more advanced features like soundproofing, dust and spore resistance for allergy sufferers and non-stick, wipe clean fibers which make cleaning a doddle. This so far has made carpets sound very appealing right? So what is the issue, well simply put the issue is installation, often expensive to hire the professionals or a horrendously daunting task when comes to the thought of laying it yourself, especially if it is going to be your first ever attempt. Well, we are here to offer reassurance and give you a glimmer of hope that the purchase and installation is not quite the behemoth of a task it seems. Together we can break down the myths and half-baked guides that already exist to bringing all that information together in a single, easy to follow, step by step guide and most importantly I will provide accurate information with helpful tips, links, and recommendations, so let’s begin. Before we begin with the main focus of this article which is the DIY method we feel it is worth running through the options available when hiring someone to do the job for you and the cost involved. Cost is your first consideration when hiring help, the second is time. It is often inconvenient to work around someone else’s schedule, especially if it means stripping a room of all its furnishings beforehand, but, this is the price to pay for calling the pros. When doing the work yourself you can do it whenever you know you have time and could even potentially section off a room if you have nowhere to move all the furniture to although I highly recommend completely clearing a room to make the job go faster and smoother. Going back to cost for a moment then, the average price in the US for a 12 by 12-foot square room ranges from $300 to $750. Keep in mind this price is an average and can dramatically shoot up depending on the size and complexity of the shape of the room, awkward shapes and patterns will increase the work and thus the price. Also, keep in mind this price does not include the cost of the groundwork, the purchase price of the carpet itself and any finishing work that might be needed like door bars. When being quoted a price, professional fitters tend to base their price off a square yard principle and charge accordingly. This is about $30 to $40 on average and is measured in much the same way as the carpet itself, this also determines the carpets price along with the material. Also, keep in mind the location, a square room is one thing but stairs, corridors and odd shaped rooms all carry their own separate price tag. These prices seem high and well that’s because they are, but they don’t have to be. Shop around, find the best quote and try and haggle if possible. Compare one company quote against another and see if one is willing to undercut the other. The best way to reduce the cost is definitely by reducing how much you need to spend on work, hence DIY, presuming that isn’t your preferred method then see below for help. Now you are considering hiring a handyman or woman to do the job. Well, the first and most obvious option is to check in store. In Store – By this, we mean the store or retailer you purchase the carpet from, the chances are if they sell carpets they will also offer some sort of installation service and this could be at a reduced price or even potentially for free if you spend enough. Stores tend to appreciate the custom so like to give their customers something in return. Word of Mouth / in Store – Presuming you have the carpet but decide not to go with the in-store service for whatever reason or maybe they don’t offer one. The option still might be available that they could offer a recommendation. The likelihood is, is that they have the number or are associated with a company that can do the installation, they are are all in the same industry after all. Any recommendation offered will likely be a trusted trader as well so ask. Alternately but sticking with the same theme of word of mouth, ask around, ask your friends, family or acquaintances if they know someone or themselves had a professional team in. This option is again a safer bet because you have the ability to see or hear first hand at the quality of work that the company or individual does. Billboards – These are a solid way of finding hopefully reliable traders at a cheaper rate as they tend to be self-advertising. My opinion would be to try and avoid shop billboards if possible and instead look in your local hardware store. These tend to be a little more reliable as these stores get used by the traders themselves when purchasing materials so their reputation can follow them. Ask someone working at the store if they have any recommendations also. Falling short of legwork then the internet is your next best option. Websites and mobile phone apps offer a fantastic and convenient catalog of tradies these days with the ability for clients to leave honest reviews and feedback. Craigslist – offers the ability to search adverts by local traders in most professions. This site tends to advertise more for business than individual traders so be careful and try to take note of reviews. Yelp – offers the ability to refine your search radius and find local businesses and services that offer the sort of expertise you need. Much like Craigslist, where reviews can be written as they are done by the public. This means there is the possibility that a review could be fake or even written by the company itself. The trick to spotting fake reviews is to look for the reviewer name, a lot of anonymous might be a red flag. Also look for the grammatical patterns. If all the reviews use the exact same or similar style of writing then it might be the same person writing multiple times. Our site – by clicking on the contractor form on our page you will be able to get up to 4 free contractor quotes. Our advice, in general, is to shop around, compare prices and hunt for a good deal. No matter what, the price is going to rise especially in comparison to doing the work yourself and that after all is the point behind this article right. So we think it’s time to begin before we get into the step by step guide, however, we would like to run through a complete list of tools and materials. There is nothing more frustrating than starting a job then having to stop and start again because you are missing vital equipment. That is often the lead cause of mistakes when doing a job like this. Safety Glasses – These are especially important for concrete flooring where there is a potential for broken pins and debris to bounce, I won’t link here as a cheap pair are most easily found in your local hardware or household product store. 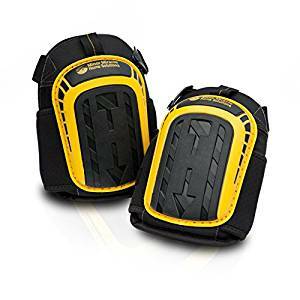 Knee Pads – These are a pretty big necessity when taking on jobs that require you to kneel down, especially when said jobs run the risk of pins and other sharp objects potentially entering your skin. These are reusable and generally speaking, for the in-home user, they are an item you’ll only ever have to buy one for a lifetime of use. Carpet – It may seem obvious or like it should go without saying that for the job of laying a carpet, having the carpet itself is a pretty big necessity. Make sure before you start the job that you physically have the carpet in your home and ready to go, also confirm it is your required size and the right design. Underlay – This is vitally important as it provides the insulation to the carpet from the flooring below. It supports the comfortable feel by providing temperature and sound protection. There are multiple types of underlay sheet, some for wooden undersurface and other for concrete, make sure you buy the suitable product for your floor, this is most easily sourced at your local hardware store. 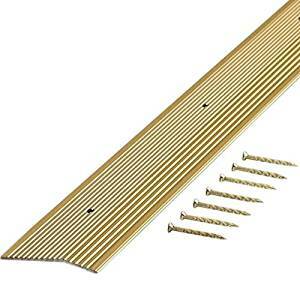 Tack Strip – This vital accessory is used around the edging of a room. It supports and holds in place the edges of a carpet which in turn stops it from moving or bunching up. 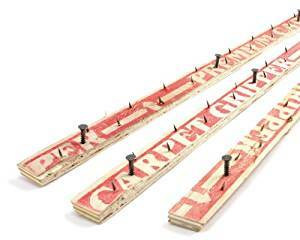 These are an absolute must for any carpet laying. There are two basic designs, the first is made for wooden base flooring, this features pins designed for wood that is usually designated by a silver color. The next design features toughened steel pins that are black in color and designed to fix to concrete flooring. Thankfully there is a product available nowadays that is a crossover of both designs, it uses toughened steel pins of a larger thickness that can handle both wood and concrete. Door Bar – The item is designed to take care of rough exposed edges the likes of which are generated under doors or other exposed spaces. A simple strip of metal like the one linked takes care of this problem by screwing down directly to the floor. It comes in a variety of colors, thicknesses and overall finished are available either online or in a store. Knee Kicker – The device might often be seen as a tool strictly used by professionals but that is far from the reality of the situation. The item is used to spread out the carpet evenly and helps with positioning the edge where the tack strip is located. Bolster – This item is used for finishing and tucking down the edges of a carpet once it is cut to size. Hammer – No point in linking as this is about one of the most readily available tools from any DIY store. It is also the most likely item that you’ll have lurking in your toolbox, it has multiple uses when laying the carpets but the most obvious is for securing the pins to the floor in the tack strip. Utility Knife – These are available anywhere and are used for cutting both the underlay and carpet. This is only a short section to amplify the importance of decorating BEFORE you lay your brand new carpet, if possible. This will be expensive and brand new so why go to the effort of laying down a nice carpet to get it covered in paint and other decorating debris. Also, consider any ceiling work that needs doing and possibly the most important consideration is a new baseboard. This is the closest thing to the brand new carpet and if this is old and tattered painted it could ruin the look. What you need to consider is how long it has been and will be between decorations. Also, think while the old carpet is coming up would it not be a great excuse to decorate the rest of the room? We are finally ready then for the installation process and with that our step by step guide begins. Before we begin laying new carpet through the old one needs removing and the underfloor cleaning, to do this scrape up and old paint, glue, and debris like plaster or concrete. Make sure you fill in and smooth out any potholes with filler cement, if you leave these they will show through and ruin the look of your new carpet. If we are dealing with floorboarding then nail down or sand off any high spots and replace any old, warped boards with new. The surface prep here is vital, don’t think that because you are adding underlay and carpet that any bad spots will be covered, sorry to say but this isn’t the case, the high and low spots will show through like a sore thumb so don’t cut corners. Do it once and do it right. Once you have completed the cleaning give it a final vacuum clean and you are ready to begin. With your newly smooth floor in place, you need to start by laying the tack strips down, these follow the out circumference of the room. Throw the strips down roughly in place then start near a door or corner. Cut the excess length using tin snips or a wood saw. They are only made of thin strips of wood so tin snips or strong builders scissors should work fine. The angles and edges don’t have to be perfect because it is going underneath the carpet after all. Once cut to length place down on the floor approximately 0.2 to 0.3 inches away from the wall or baseboard depending on the thickness of your carpet. For thinner carpets move it closer and thicker move it away. Once located correctly begin to hammer in the pins. These should go in with relative ease and make sure to avoid hitting the skirting board, especially if it is newly decorated. After the strips, you can focus on the underlay sheet itself. Take note of which way up it goes but generally speaking, whichever way a sheet unrolls is the correct way up. This next stage should be a simple case of laying down one end of the roll near a wall then unroll the sheet the length of the room making sure that one edge is butted up perfectly with the tack strip. Once complete you want to repeat the process in the middle of the room is wide enough for a separate middle piece. At some point there will likely be an overlap in the sheets, to cut the excess you need to unroll the sheet to the desired length, then you need to align both the middle edges up to each other so the excess is against the wall and cut it. It is preferable to actually do two cuts, the first is the same type you will do to the sheet once you unroll it to the correct length, that is to fold it back on itself slightly and cut so you leave an inch or so excess. This excess makes it easier to handle when cutting the final size using the tack strip as your guide. Next off then once the underlay is down and cut to length it needs securing. This stops it from moving around under the carpet which would eventually lead to the carpet bubbling coming loose. There are two separate techniques depending on what type of flooring you have. For concrete, you should use tape along each of the seems where the sheets join. This will turn the underlay into a single large, well-supported sheet and stop any unwanted movement. For wooden floors, you should consider using a staple gun. Staple it down at the corners and edges to take out any excess movement and stop the underlay from wanting to turn upwards. One the underlay is secured then give it a final check over to make sure you’re happy and confident in your work. Providing you are then moving to the next stage. When it comes to the carpet itself the progress should appear to be quite fast but that doesn’t mean rush it or get complacent. The first step is to roll your carpet out, inside the room it is going to be placed. Once unrolled you will get your first proper glimpse of how the final product will look. At this stage you may want to consider the fibre pattern of the carpet, it may look different from certain angles and in certain lighting and if you are trying to keep a continuous theme, this definitely needs to be a consideration. Once spread out then it’s time to begin fitting, make sure the excess is up against the walls but keep in mind that the hard undersurface may risk scratching paint and woodwork. When fixing down the carpet, start with a corner and force it down by hand, the overhang will try and bunch up, to solve this, fold the carpet backward on itself and cut a square out of the corner, ensuring to still leave an inch or so of overhang. 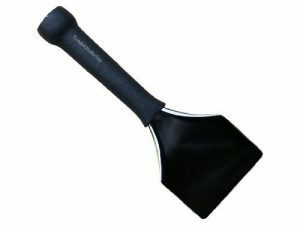 This will help to relieve some of the twists and you can now proceed to use the knee kicker. Starting in the freshly cut corner and working away from, use a moderate amount of force and begin to knee the device with the pressure going towards the wall yet down into the corner of the carpet. This will force the carpet down into the corners and let it attach to the spikes of the rail. Work your way along the wall stopping every foot or so, now use the hammer to force and smooth down the piece of carpet you’ve used the kicker on. Run the hammer up and down to force the rail pins to pierce the carpet, you’ll know this has worked when you hear a light grating sound from the hammer hitting the pins. When you hear this proceed for another foot or two. Once your first wall is complete, make sure there are no lumps or bumps in the carpet then move to the opposite wall to which you’ve just worked and then repeat the process. By reversing wall you ensure a smooth and even finish to the carpet as it is now stretched over the room. Following the knee kicker with a hammer is actually a lot more essential than you may think since it ensures a crisp fold and secures the carpet to the rail below. At this stage then you have what should look like a beautiful stretched out carpet with some rugged overhang on all side so let’s take care of that. Starting about halfway along the wall, fold the overhang down so you are looking at the underside of the carpet and make a single diagonal cut, to describe the cut better consider it at an acute angle from the wall. Now following the cut and still working from the underside, cut along the carpet by about a foot, making sure to leave about 0.3 inches of overhang towards the wall. With this leftover material, you need to force it down into the gap you left earlier using the bolster tool. 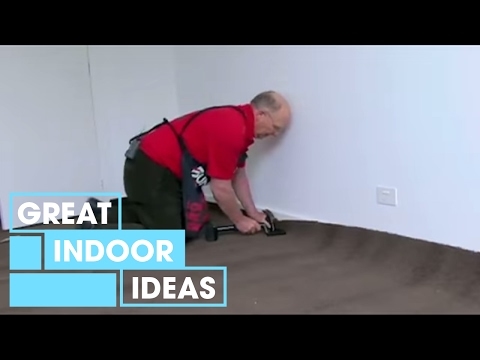 To do this simply allow the carpet to fall back into place then run the bolster tool into the freshly cut seem, this forces the edge down the hole leaving a nice crisp finish between carpet and wall or baseboard. Repeat this process until your first section is complete then proceed around the rest of the room with your knife and bolster. Once the entire of the room is done you are more or less complete with the edging work, all that’s left is the door rail. So at this point well done, you have officially installed your carpet. To install a door rail or trim, make sure your carpet is butted up to whatever floor is on the other side with a smaller gap as possible. Place down the strip over the gap and screw it down. This may come with nails or other attachments for concrete flooring so the best option is to know the floor type then ask you hardware store specialist for the correct fixing if and when you go in to buy the rail. Even when purchasing online, you should still be able to ask a store specialist for help. To wrap up this article we want to thank you for taking the time to read it. We know we have covered a lot of information here but we hope it has given a lot of guidance, inspiration, and reassurance that actually you can DIY. Many people are so scared to take charge of their own home at the risk of doing it wrong but let me tell you, there is no better feeling than when you make your attempt to do it and it goes right. Even if it does take several tries, eventually you can stand back and think “wow… I did that”. This video gives some visualization of everything we have gone over in this article and will help you, post-reading, to quickly and efficiently do the work yourself. Starting from the ground up this article and the ones like it help to turn those daunting tasks into can do activities with the reward being at the end, so good luck.